Director: William Dieterle. Cast: Paul Muni, Joseph Schildkraut, Gloria Holden, Gale Sondergaard, Donald Crisp, Louis Calhern, Henry O'Neill, Robert Barrat, Ralph Morgan, Harry Davenport, Morris Carnovsky, Vladimir Sokoloff, Erin O'Brien-Moore, Gilbert Emery, Marcia Mae Jones. Screenplay: Norman Reilly Raine, Heinz Herald, and Geza Herczeg (based on a screen story by Heinz Herald and Geza Herczeg, based on the book Zola and His Time by Matthew Josephson). 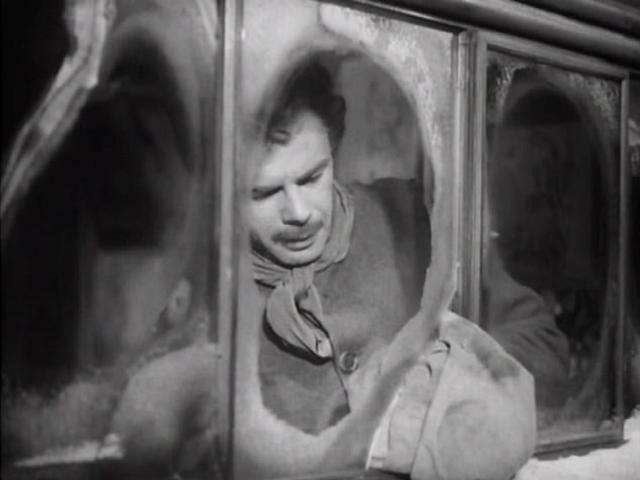 In 1937, the same year that Hungarian-born Paul Muni taped down his eyelids and hunched down his neck to play the Chinese hero of MGM's The Good Earth, he also grew out a beard and tied on some ascots to star in Warner Bros.' prestige production The Life of Émile Zola. Like George Arliss a little earlier in the decade, Muni stoked a famous reputation for himself as an ace mimic, only too happy to traverse nationalities as well as historical periods in search of a suitably august role. Though the extremely mannered, fruitily theatrical styles of both actors have dated in the extreme, invariably taking some getting used to as their films get going, you can see why they commanded such interest and respect in their own era. For the record, Muni's Zola is a much more credible creation than his Wang Lung in The Good Earth, not just because he seems genuinely impassioned during his showcase monologues, railing against social injustice and pledging his own unpopular form of editorial activism, but because Muni is savvy enough to lace the performance with traces of narcissism and arrogance. Latching on, no doubt, to an early scene where his old chum Paul Cézanne admonishes Zola for joining the same Parisian aristocracy he had built his career on critiquing, Muni allows us some key glimpses into Zola's warm self-regard. The hamminess of his acting doubles meaningfully as a proud, even flaunting aspect of Zola's righteous and very public intellectualism. The Life of Émile Zola could have used a lot more of just this sort of dimension and healthy skepticism. Instead, the patchy, overly earnest screenplay as well as the typically shapeless direction of William Dieterle keep calcifying the movie into an arid diorama, failing even to connect some especially crucial dots. Baldly appropriating the famous opening scene of La Bohème, the Oscar-winning script at least eschews the inevitable tedium of childhood scenes and "explanatory" psychological backstory. Still, Zola's speedy trajectory from principled penury to literary celebrity is both compulsory and fatally uninteresting, full of scenes that pretend to capture the exact moment when he gleaned the idea for his next book. You can spot Nana coming from a mile away, though the film seems hilariously blind to the fact that Zola's own milking of a hostile, forlorn prostitute (Erin O'Brien-Moore), annexing her memories and even her diaries for his own profitable endshe eventually mails her a copy of his book and a big, compensatory banknoteis simply another way of using this woman for money. About 45 minutes into Zola, we've already hit the full range of plot-points on which a lot of biopics would lavish two or three hours, but it's hard to appreciate the economy of the thing when we're not learning anything about Zola that one couldn't learn from a capsule entry in the Biographical Index at the back of a Merriam-Webster. The second hour slows down to focus on Zola's crucial and controversial role in the Dreyfus Affair, and though the wrongly imprisoned soldier is memorably etched by another Oscar-winner, Joseph Schildkraut, the film is awfully bashful about the anti-Semitism at the root of Dreyfus' scapegoating. Even more comically superficial are the representations of the military conspiracy against Dreyfus (counting Louis Calhern among the prim, mustachioed villains) and Zola's carnivalesque kangaroo trial for "treasonously" indicting the misdeeds of the generals and the French courts. During that trial, yet another promising performance gets strandedthis one a typically strong turn by Donald Crisp as Zola's defense attorneyas the movie veers too far away from Dreyfus and yet doesn't probe Zola's own complex motivations in clear enough detail. The sides of right and wrong have been drawn with utter rigidity, rendering all the dialogue and the performances essentially gratuitous. The film has the effect of obscuring and reducing history instead of exposing it. The arbitrary flip-flopping of The Mob in the streets, who love Zola and then hate him and then love him whenever Dieterle goads them to, is the most telling evidence of how childishly uncontextualized the movie is, just as the spurious staging and hokey timing of the final sequences, killing off Zola on the very eve of Dreyfus' public exoneration, rings an unmistakable warning against taking any of this picture very seriously. Good for the actors for continuing to give their all. Schildkraut is especially lovely in his terse, poignant playing of the moment when Dreyfus walks out of his Devil's Island prison cell, and yet the movie has had precious little to show us about Dreyfus' years in jail, and it's even more opportunistic in using his plight to refract glory onto Zola than Zola himself seems to have been. Max Steiner's score lays down some pretty thick melodies, most of them as emotionally vague as the tin-eared screenplay, and the editing is a mess: one particularly egregious cut implies that Dreyfus hopped a train from South America to Paris as soon as his name was cleared.